Opening times: Its land…it doesn’t close. Winter may be muddy and windy. Pack a mac. Age: For all those who enjoy and walk and a hill. Location: A few miles from Bovey Tracey, Devon. I spent my childhood amongst hills and sheep in tiny villages sandwiched between the Powys and Herefordshire border; it is undeniably beautiful yet I have settled in the South West. The grey sea churned up by the winder winds drew me in though I do pine for the dips and swells of the land back home…Hence our adventures up to the eastern edge of Dartmoor. 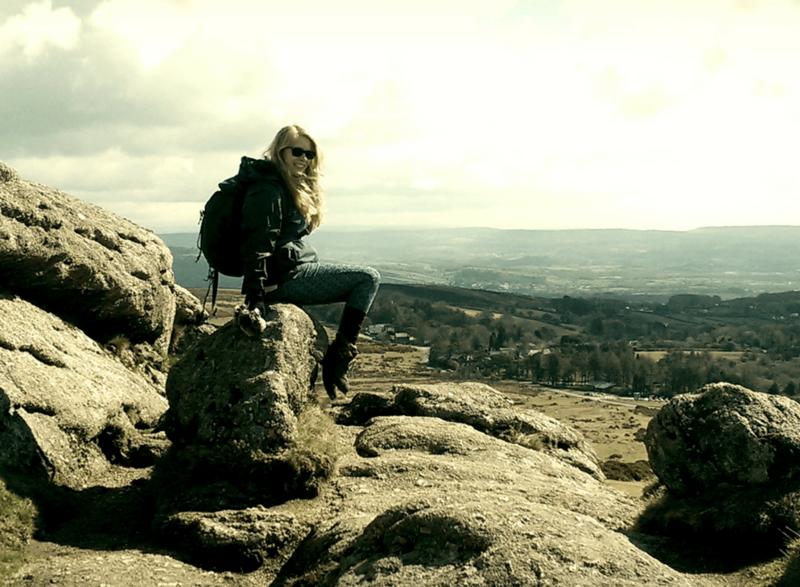 Haytor is a popular landmark; take a flask and some sandwiches. Plonk your bottom down on the short, springy grass. It is easily accessible by road. Granted some are winding, diminutive roads. Expect satnav confusion. Bus tours are popular, we tend to go early or late in the day and off season. Locally Teignmouth, Bovey Tracey, Stover and Newton Abbot are all serviced by bus so frequent and regular services operate near to the route. Adventures in the Devon countryside. There are good car parks in this area and toilet facilities are available next to the Visitor Centre (part of Dartmoor national park) which offers maps, guide books, staffed by knowledgeable locals. On occasion there is a refreshments and ice cream van, on lucky days, both. The tor itself does involve a short climb, I had a huff and puff… some people do climb onto the rocks themselves although obviously that is dangerous. There are little walks and long walks depending on how adventurous you are; put your baby in a carrier or older children in sturdy shoes… Pack a picnic, a kite, or go mini beast hunting! I know little people’s attentions are short…but I am a great encourager of dragging your kids outdoors. North east is Haytor Quarry, from that the ‘Granite Tramway’ runs to Teignmouth. It is more of a hike to be honest but if you find yourself energetic and childless I would encourage it! The local areas has lots of interesting sites and places to visits including Widecombe-in-the-Moor which is one of my favourite picturesque villages. There is only so much I can describe: you go for the views; heathland and moor, the coastline, rolling countryside and the horizon with rainclouds skittering across the towns. I had a chat with a friendly raggedy Dartmoor pony one day. These pictures are beautiful!! Looks like a nice way to spend the day.